Storm Safety: Should Local or National Radio Stations Give Disaster Advice? : NPR Public Editor When a big snowstorm recently hit the Northeast, NPR played tape of residents handling downed power lines. An appalled utility company said the reports encourage "deadly risks." Seems only sensible that NPR should give safety advice, right? But what if local radio does it better? 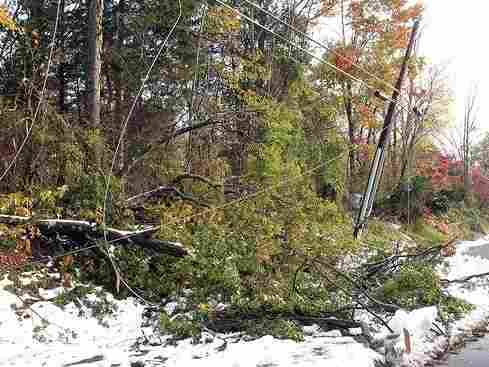 After a freak snow storm last month knocked out the power on her New Jersey street, Tracy Ross took it upon herself to try to move a tree that had fallen on a power line. She even enlisted her daughter to help, she told an Associated Press reporter. "I took an extension ladder and made her hold it while I climbed up the tree and tried to saw it," she said on air. Pulling together that field report and other clips for his hourly newscast, NPR's Craig Windham in Washington called it a "risky move." In the past day or two, we have heard NPR coverage about a mother having her oldest son move a downed power line and a woman getting on a ladder to saw off tree limbs that were touching a power line. These were reported as ways people are coping with the storm's aftermath. These people were lucky or NPR would have been reporting on serious injuries or deaths. I completely disagree that we were in any way "encouraging" people to take risks. We were reporting what people were doing, period. In regard to the two examples given, I believe the "risky move" reference gets the point across that not a lot of common sense seemed to have been exercised by those trying to remove trees from power lines. It would have been nice, in a perfect world, if the second item had carried a similar type of reference. In general, public service type messaging, especially of the specific nature recommended by the public safety director at the Michigan utility company, is more appropriate coming from a local radio station than a national radio network. We cannot be put in a position of putting out public safety warnings and tips with every snow storm, hurricane or tornado break-out we report on. That is the time-honored role of the local broadcaster whose audience is most directly impacted. The local radio station? This introduces a whole new perspective that didn't occur to me. Should a national broadcaster be giving local advice for something so specific? Ombudsman intern Andrew Maddocks called WNYC, the public radio station in New York City that covers much of New Jersey, and learned that it in fact did warn listeners to stay away from power lines, among other safety advice, usually embedded in its own frequent news reports. On Oct. 30, WNYC hosted New Jersey Governor Chris Christie on its local Morning Edition show, for example. The governor told parents to bring flashlights and tread carefully around downed power lines while trick-or-treating. Updates on WNYC's news blog shared anecdotes and advice about dangers such as the fire hazard of kerosene lamps and the asphyxiation that can be caused by running generators indoors. "We think about this kind of thing a lot," said John Keefe, a WNYC news director. "I definitely find that we're not just reporters, we're providing information in the public service." During Hurricane Irene, after New York City's official website went down, WNYC became a public go-to place for its interactive map identifying flood zones and evacuation centers. Show hosts interrupted programming to give information on air. Keefe said that he's been in news meetings where such questions arise as what should parents talk about with their kids if they're sheltered in a basement for a few hours. This might not be newsy, but it's helpful. Offering another local perspective, Dan Gorenstein, a general assignment reporter for New Hampshire Public Radio, said the most effective advice is often mixed into news reports. "Back announces" (additional information following a news report) are frequently used to send listeners to his station's website for more information. "I've reported on enough people dying...and I want to emphasize that word...because they stubbornly insisted on running a generator in their home, or clearing tree debris, that I begin to really appreciate the value of spreading the word," Gorenstein said. In other words, local public radio stations can give much more specific, frequent and relevant advice than national NPR can, and they often do. That said, it seems only normal and morally correct to me that NPR reporters should give public service offer advice when it fits—and try to make it fit when they can. There is nothing to lose—and possibly a life to gain.